A new approach to harvesting solar energy, developed by MIT researchers, could improve efficiency by using sunlight to heat a high-temperature material whose infrared radiation would then be collected by a conventional photovoltaic cell. This technique could also make it easier to store the energy for later use, the researchers say. In this case, adding the extra step improves performance, because it makes it possible to take advantage of wavelengths of light that ordinarily go to waste. The process is described in a paper published this week in the journal Nature Nanotechnology, written by graduate student Andrej Lenert, associate professor of mechanical engineering Evelyn Wang, physics professor Marin Solja?i?, principal research scientist Ivan Celanovi?, and three others. A conventional silicon-based solar cell “doesn’t take advantage of all the photons,” Wang explains. That’s because converting the energy of a photon into electricity requires that the photon’s energy level match that of a characteristic of the photovoltaic (PV) material called a bandgap. Silicon’s bandgap responds to many wavelengths of light, but misses many others. To address that limitation, the team inserted a two-layer absorber-emitter device — made of novel materials including carbon nanotubes and photonic crystals — between the sunlight and the PV cell. This intermediate material collects energy from a broad spectrum of sunlight, heating up in the process. When it heats up, as with a piece of iron that glows red hot, it emits light of a particular wavelength, which in this case is tuned to match the bandgap of the PV cell mounted nearby. There have been many practical obstacles to realizing that potential; previous experiments have been unable to produce a STPV device with efficiency of greater than 1 percent. But Lenert, Wang, and their team have already produced an initial test device with a measured efficiency of 3.2 percent, and they say with further work they expect to be able to reach 20 percent efficiency — enough, they say, for a commercially viable product. The design of the two-layer absorber-emitter material is key to this improvement. Its outer layer, facing the sunlight, is an array of multiwalled carbon nanotubes, which very efficiently absorbs the light’s energy and turns it to heat. This layer is bonded tightly to a layer of a photonic crystal, which is precisely engineered so that when it is heated by the attached layer of nanotubes, it “glows” with light whose peak intensity is mostly above the bandgap of the adjacent PV, ensuring that most of the energy collected by the absorber is then turned into electricity. In their experiments, the researchers used simulated sunlight, and found that its peak efficiency came when its intensity was equivalent to a focusing system that concentrates sunlight by a factor of 750. This light heated the absorber-emitter to a temperature of 962 degrees Celsius. This level of concentration is already much lower than in previous attempts at STPV systems, which concentrated sunlight by a factor of several thousand. But the MIT researchers say that after further optimization, it should be possible to get the same kind of enhancement at even lower sunlight concentrations, making the systems easier to operate. Such a system, the team says, combines the advantages of solar photovoltaic systems, which turn sunlight directly into electricity, and solar thermal systems, which can have an advantage for delayed use because heat can be more easily stored than electricity. The new solar thermophotovoltaic systems, they say, could provide efficiency because of their broadband absorption of sunlight; scalability and compactness, because they are based on existing chip-manufacturing technology; and ease of energy storage, because of their reliance on heat. January 26, 2014 - Solar Thermophotovoltaic Cells Can Generate Electricity at Night ENGINEERING.comSolar Thermophotovoltaic cells use more of the solar spectrum and generate electricity at night. 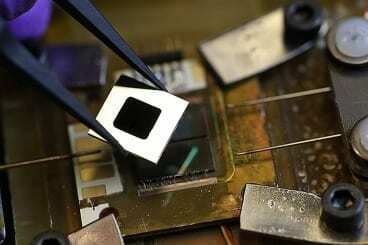 January 20, 2014 - Thermophotovoltaic Device Has Potential to Reach Huge Solar Efficiencies IEEE SpectrumMIT researchers report progress on solar power concept that eliminates standard solar cell physical limits.